A simple thin crust pizza dough. You will never need to buy from the store again. Combine the water and yeast in a mixing bowl, and stir to dissolve the yeast. Add the flour and salt to the bowl and mix until you have a soft dough. Knead the dough for approximately 5 minutes until all the flour is blended well. The dough should be smooth and elastic and still feel moist and slightly tacky. Place in a bowl and cover while you prepare toppings. See tip below. Divide the pizza dough in half and place on parchment paper. Bake for 5 minutes the gently slide parchment paper away from under the pizza allowing pizza to cook remaining time directly on stone. Bake an additional 5 minutes or until the crust is brown and toppings bubbling. 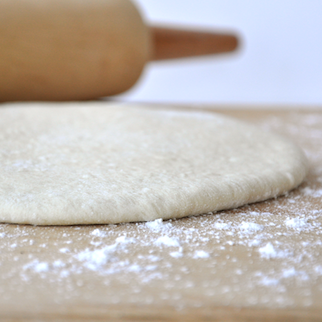 Let dough rise for about 1 ½ hours if time permits. Dough will have doubled in size.